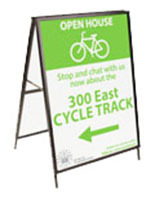 Want to reach out to passersby on the street? 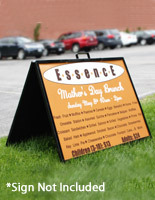 Our restaurant sidewalk signs feature menus and drink specials to bring in customers. 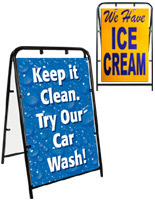 This pavement signage ideal for drawing attention to dining establishments as as well as hotels, theaters, and retail storefronts. 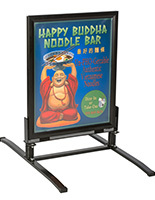 Each restaurant sidewalk sign is made for featuring posters outdoors, often to both sides of traffic. 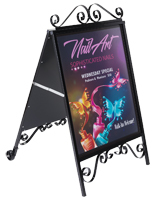 These A-frames and T-style displays are great for featuring personalized graphics that sells your unique brand to passersby. 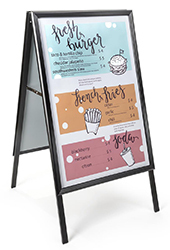 Our restaurant sidewalk signs are offered with a number of features that make them great for marketing businesses outside the front door. 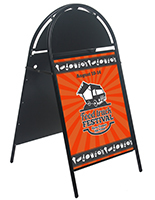 Why choose these menu sandwich boards? 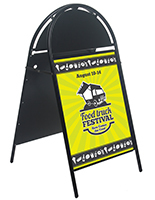 These restaurant sidewalk signs are available in a variety of styles to meet the needs of different businesses. 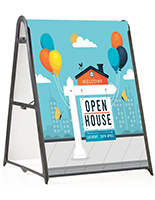 A-frames fold up for easy transportation and storage. 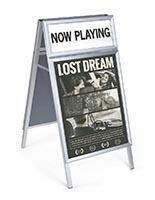 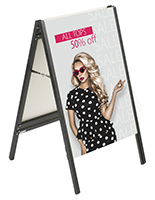 These sandwich boards have an angled presentation that naturally aims up at pedestrians' eyes for extra visibility. 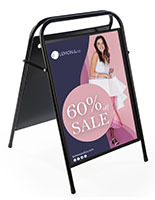 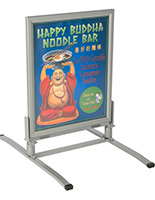 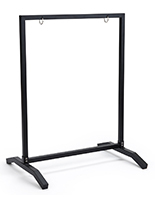 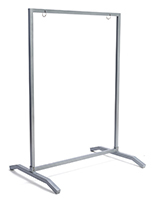 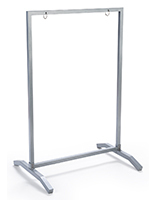 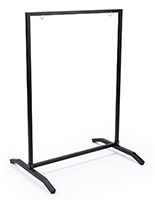 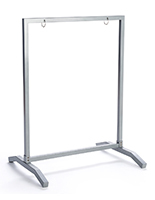 Spring signage stands are made for wind resistance — they'll gently lean back instead of knocking over! 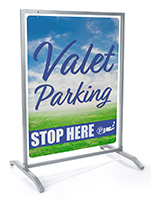 This option is excellent for windy city streets and rural areas. 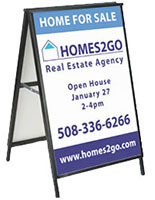 Swinging signage features hanging graphics to resist high winds. 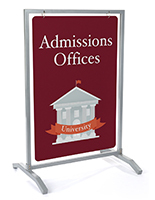 Instead of using paper posters, this style is made for displaying rigid panels. 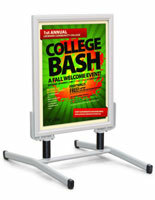 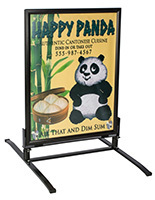 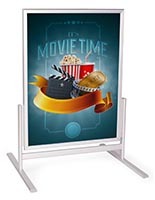 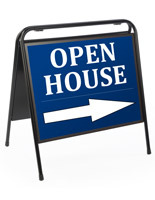 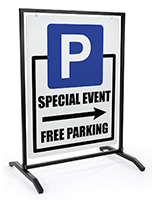 Our street displays feature common poster sizes such as 22" x 28," 24" x 36," and 30" x 40." 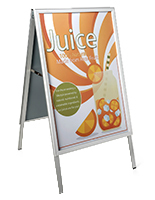 These high visibility graphics give café and bar owners ample space for menus and specials. 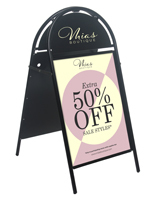 All of our pavement signage is double sided to advertise to both sides of traffic. 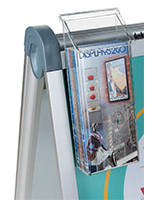 Some poster holders have extra header areas for additional messaging space. 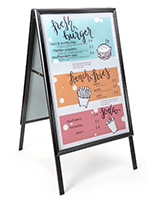 The sidewalk signs for restaurants are made for outdoor use, but not all of them have a weather-resistant design. 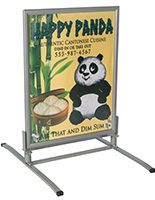 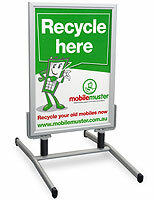 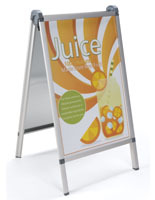 The included clear PVC lens protects posters from water damage and dust. 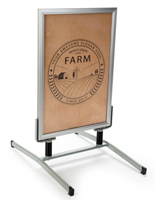 This is a great way to ensure your presentation looks professional, rain or shine. 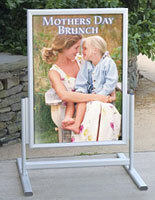 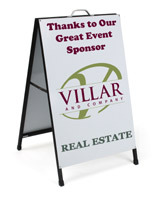 Sidewalk signs with included custom printing make it easier to business owners to feature their message. 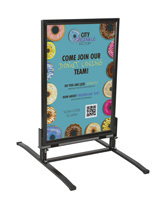 Instead of going to a print shop, submit your design and we'll create a graphic panel with our high quality digital printer. 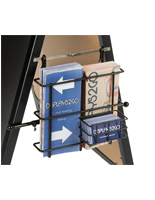 Use the filter on the left to browse our personalized models. 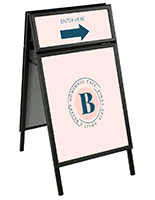 Our street signs for cafés are easy to change when it comes to updating menus. 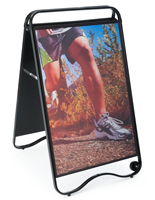 Displays with snap-open frames make it easy to replace prints by simply unfolding the edges, removing the lens, and changing out the poster. 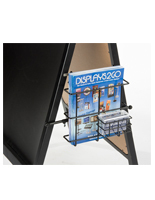 No need to disassemble the whole unit just to feature new drink specials! 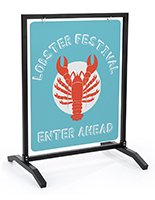 The other option, slide-in framing, features a simple design with an affordable price. 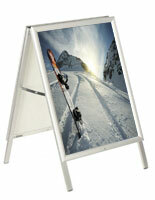 Simply push insert prints through the top or the side of the frame. 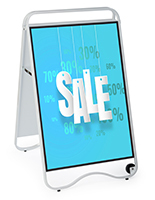 Want an easy-to-customize alternative? 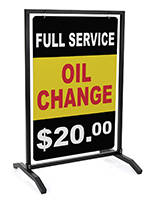 Blackboards, whiteboards, and write-on street signage makes it easy to update menus and drink specials. 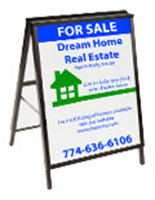 Simply erase and rewrite! 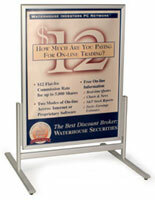 We offer so many solutions for getting the word out about your business.